What Does Tiote Actually Offer? We are too big to go down was the cry? Well we did, and we deserved it. Even the most blinkered of fans could see that and yet again we find ourselves looking at the wrong end of the table rather than the other end as we did for most of last season. 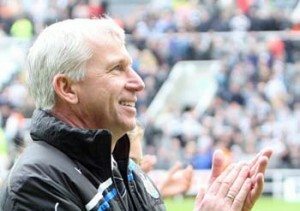 ‘Pardew out’ has been whispered, usually by those void of thought and reason, usually fans sitting tweeting from the warmth of the front room rather than being at the games. With, as always, the Mackems taking great pleasure in Pardew’s failure, failure? Really? As usual they are more consumed with hate for our club than supporting their own club, who I might add are so poor if anyone is going to be in a relegation scrap it will be them, but enough of the party with Marty gang. What is going wrong at St James, injury? Cisse losing his goal scoring touch? I think the clear and simple answer in this case is lack of investment, just when it looks like Ashley had won over the fans, a desperately poor summer of recruitment has hampered what should have been a season to really consolidate our position as a consistent top 6 side. We have real genuine quality in our squad and it’s easy as a supporter to think all our players are world beaters, though in the cold light of day they are far from it. However, in Ben Arfa, Ba, Cabaye, Colo, Santon and Krul we have a real core of quality that is comparable with the top 4, however it is beyond these 6 that things begin to unravel somewhat. Simpson and Williamson have been so consistently poor for 2 seasons it was only a matter of time before these cracks would appear and it is these two areas in particular that needed investment…it didn’t materialise. I think it’s important we discuss Tiote (huge sigh! ), we need to stop thinking in Tiote we have a footballer who we can compare to the likes of Yaya Toure because as much as it pains me to say it, we don’t. He gives the ball away so much I have started to question what it is he offers to the team now, £20million? No chance! But what of the young boys? Sammy? Ferguson? Bigi? All potential stars and I say that with my football head on and not my NUFC head on, however the concern is during times of struggle throwing them in and expecting them to dig us out of the mire, is not fair on them or their development. But has it all gone wrong? And what now do we judge as success at this football club. One club I want to mention is Everton and one man in particular, David Moyes, touted as the potential successor to Fergie. There have been times when Moyes and his team have been at the wrong end of things, yet the board, to their credit, have stood by him. They’ve instilled stability into the club and built a team that many envy and do not relish facing, this is what I believe Ashley is trying to do, often long term gains need short term failure to allow them to be brought to fruition, sacking Pardew would be more pointless than a Lee Cattermole tackle. It achieves nothing. Lets have a bit of a reality check; yes the Europa League is rubbish, yes we are hovering above the relegation zone, yes injuries are blighting us and yes yes yes we all know we need to sign players in Jan. Lets be realistic, until Fifa brings in financial constraints on clubs like Man City and Chelski we simply need to stick to the mantra Ashley has set us out for the long term and not just 4 games that we have lost, ask yourself would you rather have Souness or Kinnear back? No I didn’t think so! Would you rather watch Ben Arfa or Lee Bowyer? So stop the moaning and be thankful for where the club is now.